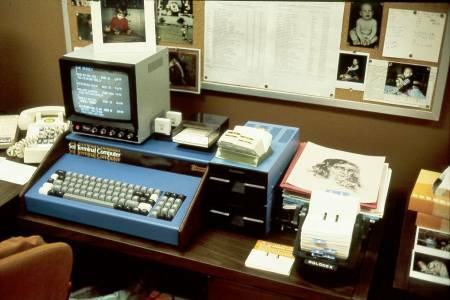 A LINC-8 computer similar to the one shown below was the first computer I had the chance to work with while I was a medical student at the Bowman Gray School of Medicine of Wake Forest University in Winston-Salem, N.C. 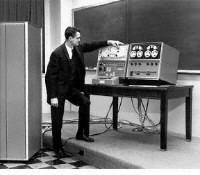 The LINC-8 was one of the first computers oriented toward data manipulation for physiology research, and the model at our medical school included a few interactive teaching programs for the medical basic sciences. These programs were great for drill and review and provided appropriate feedback for correct or incorrect answers on quizes. 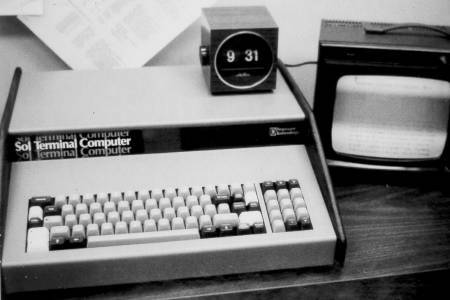 The LINC-8 was a large, expensive and still fairly difficult to program machine. 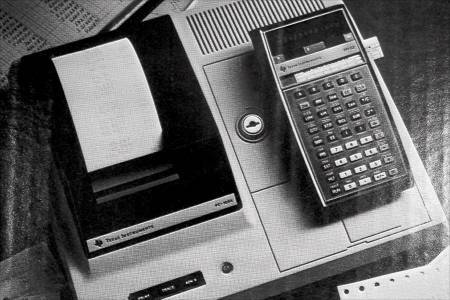 But as the first programmable calculators and "personal computers" became available it became obvious that many ultrasound studies requiring fairly intensive calculations prior to generating a final report could be "streamlined" by the use of the power of the computer. At Texas Tech one of the first applications of computing power made use of the Texas Instruments programmable calculator and its accessory printer for calculating and summarizing values in echocardiographic and obstetrical ultrasound exams. Programs could be stored on small magnetic strips about the size of a stick of chewing gum. Notice the top row of keys labeled A-E: these could be custom programmed and were used to generate selected echocardiogram or obstetrical parameters once the basic data had been entered. 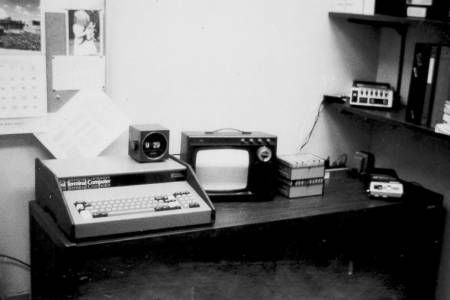 One of the first true computers (as opposed to programmable calculators) used in the ultrasound lab at Texas Tech was the "Sol Terminal Computer" which came with a whopping 4K of RAM, used a small black and white TV for a screen, and stored and retrieved programs and data from a Panasonic cassette tape recorder (which impressively started and stopped under computer control) - note the black & white images. 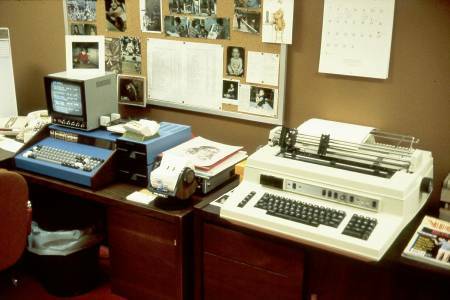 The color images show a later setup using the Sol computer, with a black and white video monitor (not just a small TV) and a dual-drive 5 1/4 inch floppy disk drive which greatly improved data storage and retrieval. With the addition of the large "daisy wheel" printer we finally had a system which could generate final obstetrical ultrasound reports on the same forms used for all other transcription. 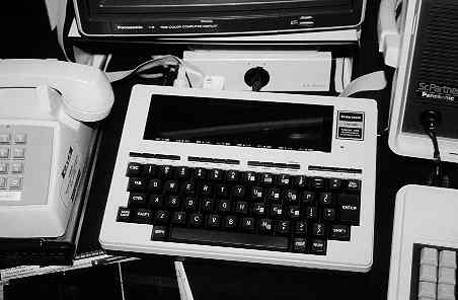 The arrival of the Radio Shack Model 100 "Microexecutive Work Station" marked a real step up in convenience of data entry (full and well layed-out keyboard) and in distribution of final reports. The setup shown below was used for data entry and report generation for obstetrical ultrasound scans. The final report could be printed locally or sent by (300 baud!) modem to the obstetrical clinic three floors up in the medical center. An auto-answer serial modem attached to an Epson serial printer allowed the reports to be printed "unattended" at any hour of the day or night. Notice the Panasonic "Sr. Partner" computer at the right side of the picture - this was an early portable computer about the size of a sewing machine. It featured a built-in thermal printer, making it a completely self-contained system for use in satellite clinic locations where reports could be generated "on-the-spot". These were later Xeroxed to provide a non-fading report for archiving since the thermal paper was prone to fading. 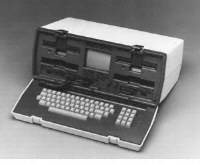 It seems that over the years we have used just about every "personal computer" made including those from Osborne (like the Osborne-1 shown below), the Panasonic Sr. 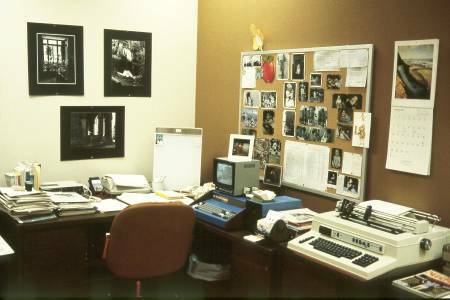 Partner (seen in the right edge of the photo above), a Zenith portable which looked like a lunch box and had two 5 1/4 inch floppy disk drives and a built-in modem, and a wide variety of IBM-compatible portables from Fujitsu, Toshiba, Sony and IBM. This web page was composed on an IBM ThinkPad i1472 and uploaded to our server using a Motorola TimePort phone on the Sprint PCS wireless network.